A continuous positive airway pressure (CPAP) device is a lifesaving tool for those that have obstructive sleep apnea (OSA) or other breathing disorders that interrupt sleep and cause or exacerbate potentially life-threatening illnesses and conditions. Despite the benefits of CPAP, though, many first-time users have some difficulty adjusting to it. However, with patience and practice, using a CPAP machine can become much more comfortable and can significantly improve quality of life and overall health. Problems related to CPAP use are generally caused by either the machine and mask, or the intensity of the air flow. However, the good news is most of these problems can be overcome either by making sure the fit and style of the machine and mask are correct and/or using desensitization techniques to become gradually more accustomed to wearing it over time. Check the air filter and clean it as needed. Upgrade to a newer machine (these are generally covered by insurance). Use ear plugs to dampen the sound. Use a white noise machine to neutralize the sound. Place the machine as far from the bed as possible. Problems with the fit and style of the mask are some of the most reported issues associated with the use of CPAP. Fortunately, there are a number of different styles and types of masks available. Choosing the right mask can significantly reduce discomfort and increase the benefits experienced with CPAP. The most common problem associated with an ill-fitting mask is skin irritation or breakdown. These can be caused by a too large or too small face or nasal mask. Check with the sleep specialist to ensure the fit is correct and if using a full-face mask, consider changing to a nasal mask or nasal pillow. Be sure the straps that hold the mask in place are not adjusted too tightly or loosely. The mask should be snug to prevent air leaks, but not so tight it causes discomfort. The best fit for a mask can be obtained by trying different sizes and styles when lying in your normal sleeping position to see what works best. Feelings of claustrophobia may be an issue for those who need to wear a full face mask. To reduce those feelings, try using the following desensitization techniques. First try holding just the mask up to your face for very brief periods. Increase the amount of time gradually, and then add the hose to the mask and repeat the process. When you're comfortable with the mask and hose connected, turn on the air pressure for short periods. Eventually, add the straps to the process and increase the length of time you wear it, until you can wear it throughout the night. This process may take a considerable amount of time; however, it is generally a very reliable way to ensure comfort and adherence to the protocol. Relaxation techniques, like flexing and loosening each muscle group successively, can be combined with the desensitization process to help reduce anxiety. It may also help to engage in distracting activities, like watching television, while conducting the desensitization process. Focus on the therapeutic benefits, not the negative feelings. Some CPAP users have difficulty falling asleep with the equipment in place, even if they are experiencing no other problems. It may be necessary to try some of the desensitization and relaxation techniques just to get used to having the mask in place, but there are some other options, as well. Using a pillow designed to support use of a CPAP device can be a big help. These pillows provide additional head and neck support and often include a hollowed-out space to allow room for the mask. There are pillows designed especially for people who sleep on their back, side, or stomach. Some styles of pillows accommodate any type of sleeper. It may take trial and error, but these specially designed pillows may eliminate common problems quickly and easily. Additionally, be sure to avoid caffeine and other stimulants several hours prior to bedtime. Establishing and following a bedtime routine and using the bed only for sleep may help as well. Incorporating the CPAP device as part of the nightly routine will help users become familiar with it, and thereby lessen any feelings of discomfort. Taking the mask off without realizing it while sleeping is another common occurrence for new CPAP users. This can be due to a poorly fitted mask, the intensity of the airflow, or simply not liking the feeling of something over the face. There are a number of things to try in this case. First, make sure the mask is properly fitted. To adjust it correctly, sit on the edge of the bed, place the mask over your face, and then lie down. Once in a prone position, gradually tighten the straps only until a seal is created. Use some of the desensitization techniques described above during the day to help get used to the feel of the mask at night. Consider wearing it while engaging in some distracting activities so your body adjusts to the feel of the mask. Try switching to a full face mask instead of a nasal pillow or nose mask and use a chin strap to help make it more difficult to remove. Set an alarm for part-way through the night to ensure the mask is still in place or put it back on if it has been removed. If the problem persists, talk with the sleep specialist. Eye irritation is generally caused by a mask that is too small or improperly positioned. If the mask does not fit properly over the bridge of your nose, air will leak out and blow into your eyes. This will make your eyes dry and itchy. You can alleviate this problem by switching to a nasal pillow instead of a face mask or adjusting the head straps on a full face mask. There are a couple of different avenues to choose from if tolerating forced air is difficult. 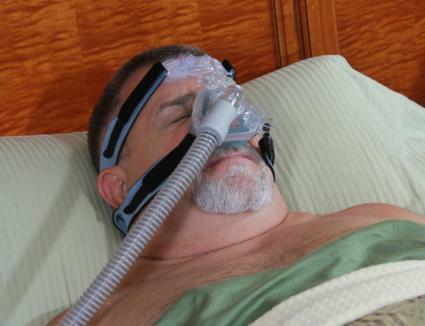 Most of the newer models of CPAP machines have a ramp feature on them that allows the air pressure to be adjusted to a lower setting when initiating treatment each night. The pressure will increase as the night goes on, but starting out at a lower pressure setting helps some CPAP users fall asleep more readily and comfortably. If using the ramp feature doesn't seem to be helping, there are two other types of machines that have features that may provide more relief. A B-PAP (bi-level pressure) device provides more air pressure when inhaling and less when exhaling, which some people find more comfortable to use. 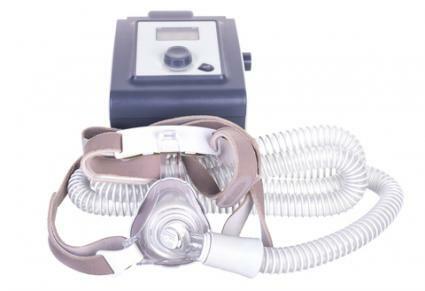 There is also an A-PAP (automated pressure) which automatically adjusts to the breathing needs of the wearer. This automated machine is particularly helpful for those whose breathing patterns vary throughout the sleep cycle. Drying and congestion are a common occurrence with CPAP use, but these symptoms are generally readily alleviated by using a heated humidifier, which can be connected to the CPAP device. Many of the newer models have an internal humidifier already installed. This heats and moistens the air, which reduces the symptoms significantly. Using saline, other nasal sprays, or over-the-counter oral medications that relieve cold and/or allergy symptoms can also help. Although about half the people using a CPAP device experience these cold-like symptoms, most of them disappear within a month of use as the body adjusts to the presence of the CPAP device. When users experience a headache or ear pressure while using CPAP, the symptoms are often related to underlying sinus congestion or allergies rather than as a direct result of the CPAP device itself. Treating the underlying condition with medications may help, but if the problem persists, talk with a professional. Using the CPAP when cold symptoms are present can help you breathe easier, but there are exceptions so it is best to get the advice of a physician. Bloating, which is caused by swallowing rather than breathing the forced air, is not a common problem, but it does occur in some cases. This problem usually affects those first beginning therapy. Although there is no medical solution, some people find relief by changing their sleeping position. CPAP pillows may help, as well. A physician may recommend lowering the air pressure temporarily or suggest switching to an A-PAP device, which regulates the air pressure and decreases the likelihood of swallowing air. About 65 percent of CPAP users say sleeping on one side or the other is the best way to get comfortable while wearing the mask. Sleeping on the left side also has the added benefit of relieving heartburn symptoms. 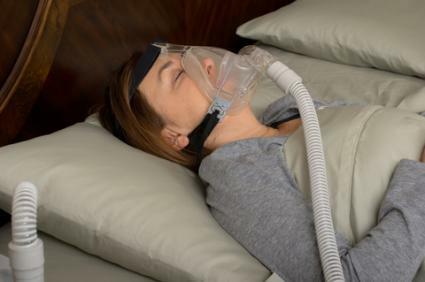 Although it is possible to sleep on the stomach while wearing a CPAP mask, it may not be very comfortable without using a CPAP pillow designed for that purpose, which can help support the mask and neck. For OSA patients, sleeping on the back is the worst possible position. Laying flat on the back allows the tongue to drop back into the throat, which can obstruct breathing. To change sleep positions, it may be necessary to employ the hat trick. Wearing a baseball cap backward and placing the straps and facemask over the hat may help back sleepers change their position, as the hat bill would prevent back sleepers from getting very comfortable. This strategy also helps keep the mask in place (particularly for balding men) and can reduce strap marks on the face and head. Wearing the bill facing forward can assist users in keeping the hose out of the way and make the whole system more secure and comfortable. Remember that adjusting to a CPAP is a process that may take considerable time. It is very important to continue the therapy, as the benefits are only present when you use the machine. WebMD suggests focusing on the positive health benefits and educating yourself regarding the use of your CPAP machine. Manufacturers often provide personal support; representatives will come and help you set up and regulate your equipment to ensure you are getting the best therapy possible. There are also numerous support groups available online where you can trouble shoot any problems and learn about other people's experiences. With time and patience, using CPAP therapy should not only significantly improve your health, but your overall quality of life, as well.